Delta II rocket systems are used in a variety of applications. Delta II is the current operational configuration of the original Thor-Delta family of launch vehicles which were based on the Thor ICBM of the 1950's. During the development of the Space Shuttle program, expendables such as Delta, Atlas and Titan were phased out. 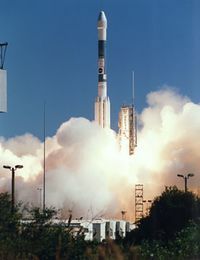 The Challenger accident (January 28, 1986), spurred renewed investment in expendable launch vehicles such as the Delta II. This page was last edited on 17 December 2018, at 17:03.